← Bodh Gaya blasts: Bihar govt(Indian State) bolsters security. An unmanned US jet has landed aboard an aircraft carrier for the first time. “Salty Dog502”, the US Navy’s X-47B drone, landed on the USS George H W Bush off the coast of Virginia, its first landing on a ship. The bat-wing aircraft has a 3,200km (2,000 mile) range and the ability to carry the equivalent of two precision-guided bombs. 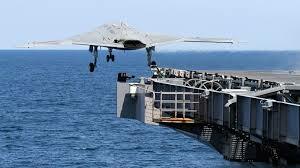 The drone was first launched from the aircraft carrier in May but returned to a mainland runway. Posted on July 12, 2013, in Aviation, Navy. Bookmark the permalink. Leave a comment.